An artificial eye is a replacement for a natural eye lost because of injury or disease. Although the replacement cannot provide sight, it fills the cavity of the eye socket and serves as a cosmetic enhancement. Before the availability of artificial eyes, a person who lost an eye usually wore a patch. An artificial eye can be attached to muscles in the socket to provide eye movement. Today, most artificial eyes are made of plastic, with an average life of about 10 years. Children require more frequent replacement of the prosthesis due to rapid growth changes. As many as four or five prostheses may be required from infancy to adulthood. According to the Society for the Prevention of Blindness, between 10,000 and 12,000 people per year lose an eye. Though 50% or more of these eye losses are caused by an accident (in one survey more males lost their eyes to accidents compared to females), there are a number of inherited conditions that can cause eye loss or require an artificial eye. Microphthalmia is a birth defect where for some unknown reason the eye does not develop to its normal size. These eyes are totally blind, or at best might have some light perception. Some people are also born without one or both eyeballs. Called anophthalmia, this presents one of the most difficult conditions for properly fitting an artificial eye. Sometimes the preparatory work can take a year or more. In some cases, surgical intervention is necessary. Retinoblastoma is a congenital (existing at birth) cancer or tumor, which is usually inherited. If a person has this condition in just one eye, the chances of passing it on are one in four, or 25%. When the tumors are in both eyes, the chances are 50%. Other congenital conditions that cause eye loss include cataracts and glaucoma. One survey showed that 63% of eye loss due to disease occurs before 50 years of age. There are two key steps in replacing a damaged or diseased eye. First, an ophthalmologist or eye surgeon must remove the natural eye. There are two types of operations. The enucleation removes the eyeball by severing the muscles, which are connected to the sclera (white of eyeball). The surgeon then cuts the optic nerve and removes the eye from the socket. 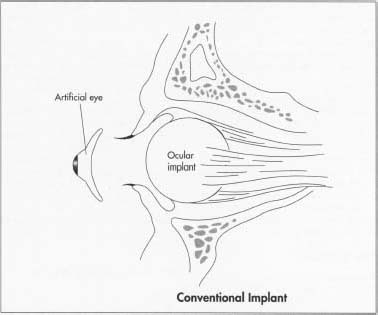 An implant is then placed into the socket to restore lost volume and to give the artificial eye some movement, and the wound is then closed. With evisceration, the contents of the eyeball are removed. In this operation, the surgeon makes an incision around the iris and then removes the contents of the eyeball. A ball made of some inert material such as plastic, glass, or silicone is then placed inside the eyeball, and the wound is closed. At the conclusion of the surgery, the surgeon will place a conformer (a plastic disc) into the socket. The conformer prevents shrinking of the socket and retains adequate pockets for the prosthesis. Conformers are made out of silicone or hard plastic. After the surgery, it takes the patient from four to six weeks to heal. The artificial eye is then made and fitted by a professional ocularist. Early artificial eye makers may not have been creating prostheses at all, but rather decorations for religious and aesthetic purposes. In the millennia B.C. , the people of Babylon, Jericho, Egypt, China, and the Aegean area all had highly developed arts and a belief in the afterlife. Radiographs of mummies and tombs have revealed numerous artificial eyes made of silver, gold, rock crystal, lapis lazuli, shell, marble, enamel, or glass. The Aztec and Inca also used artificial eyes for similar reasons. The skill of the Egyptian artists was so great that they were probably asked to create artificial eyes for human use, especially if the afflicted were royalty. In 1579, the Venetians invented the first prosthesis to be worn behind the eyelids. These artificial eyes were very thin shells of glass, and therefore, did not restore the lost volume of an atrophied or missing eyeball. Because the edges were sharp and uncomfortable, the wearers had to remove the eyes at night in order to get relief from discomfort and to avoid breakage. After the invention of this glass shell prosthesis, there were no significant advances in artificial eyes until the nineteenth century. In the early 1800s, a German glassblower by the name of Ludwig Muller-Uri, who made life-like eyes for dolls, developed a glass eye for his son. Though it took 20 years to perfect his design, his success forced him to switch occupations to making artificial eyes full-time. In 1880, Dutch eye surgeon Hermann Snellen developed the Reform eye design. This design was a thicker, hollow glass prosthesis with rounded edges. The increase in thickness restored most of the lost volume of the eye and the rounded edges gave the patient much more comfort. Germany became the center for manufacturing glass artificial eyes. Several years later in 1884, a glass sphere was implanted for the first time in the scleral cavity (the hollowed out interior of the white of the eyeball) after evisceration. An English doctor, Phillip Henry Mules, used the implant to restore lost volume and to give the prosthesis some movement. The sphere implant was subsequently adapted for the enucleated socket as well. Many materials such as bone, sponge, fat, and precious metals have been used for implants since then, but 100 years later, the Mules sphere is still used in the majority of cases. Eye sockets with spheres within the scleral cavity following evisceration continue to result in excellent cosmetic results. For the enucleated socket another solution had to be found. During World War II, the glass eyes from Germany were unavailable, and therefore, the United States had to find an alternate material. In 1943, the U.S. Army dental technicians made the first plastic artificial eye. This material had the advantage of being unbreakable as well as malleable. Though these plastic prosthesis were impression-fitted, the back surface was not completely polished, leading to irritation of the eye socket due to a poor fit. An alternative was introduced by German-American glass blowers who were learning to make artificial eyes out of plastic using the Reform design. Though this type of artificial eye was an improvement, there were still problems with a persistent discharge of mucus from the eye socket. The wearers could sleep with the prosthesis in place, but were required to remove it every morning for cleaning. Despite these limitations, demand outpaced what the ocularists could handle, and therefore, a few large optical companies began mass producing the 12 most commonly used glass eye shapes. Called stock eyes, they have the disadvantage of not being properly fitted to the individual's eye socket. In the late 1960s the modified impression method was developed by American Lee Allen. This method included accurately duplicating the shape of the individual socket, as well as modifying the front surface of the prosthesis to correct eyelid problems. The back surface of the prosthesis must also be properly polished for an optimum fit. This method is widely used today. 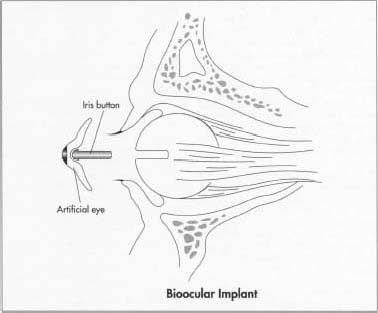 For a bioocular implant, the surgeon makes an incision around the iris and then removes the contents of the eyeball. A ball made of some inert material such as plastic, glass, or silicone is then placed inside the eyeball and the wound is closed. The time to make an ocular prosthesis from start to finish varies with each ocularist and the individual patient. A typical time is about 3.5 hours. Ocularists continue to look at ways to reduce this time. There are two types of prostheses. The very thin, shell type is fitted over a blind, disfigured eye or over an eye which has been just partially removed. The full modified impression type is made for those who have had eyeballs completely removed. The process described here is for the latter type. The ocularist inspects the condition of the socket. The horizontal and vertical dimensions and the periphery of the socket are measured. The ocularist paints the iris. An iris button (made from a plastic rod using a lathe) is selected to match the patient's own iris diameter. Typically, iris diameters range from 0.4-0.52 in (10-13 mm). The iris is painted on the back, flat side of the button and checked against the patient's iris by simply reversing the buttons so that the color can be seen through the dome of plastic. When the color is finished, the ocularist removes the conformer, which prevents contraction of the eye socket. Next, the ocularist hand carves a wax molding shell. This shell has an aluminum iris button imbedded in it that duplicates the painted iris button. The wax shell is fitted into the patient's socket so that it matches the irregular periphery of the socket. The shell may have to be reinserted several times until the aluminum iris button is aligned with the patient's remaining eye. Once properly fitted, two relief holes are made in the wax shell. For a conventional implant, the surgeon removes the eyeball by severing the muscles, which are connected to the sclera (white of eyeball). The surgeon then cuts the optic nerve and removes the eye from the socket. An implant is then placed into the socket to restore lost volume and to give the artificial eye some movement, and the wound is closed. impression of the eye socket attached to the back side of the wax shell. The iris color is then rechecked and any necessary changes are made. The plastic conformer is reinserted so that the final steps can be completed. A plaster-of-paris cast is made of the mold of the patient's eye socket. After the plaster has hardened (about seven minutes), the wax and alginate mold is removed and discarded. The aluminum iris button has left a hole in the plaster mold into which the painted iris button is placed. White plastic is then put into the cast, the two halves of the cast are put back together and then placed under pressure and plunged into boiling water. This reduces the water temperature and the plastic is thus cured under pressure for about 23 minutes. The cast is then removed from the water and cooled. The plastic has hardened in the shape of the mold with the painted iris button imbedded in the proper place. About 0.5 mm of plastic is then removed from the anterior surface of the prosthesis. The white plastic, which overlaps the iris button, is ground down evenly around the edge of the button. This simulates how the sclera of the living eye slightly overlaps the iris. The sclera is colored using paints, chalk, pencils, colored thread, and a liquid plastic syrup to match the patient's remaining eye. Any necessary alterations to the iris color can also be made at this point. The prosthesis is then returned to the cast. Clear plastic is placed in the anterior half of the cast and the two halves are again joined, placed under pressure, and returned to the hot water. The final processing time is about 30 minutes. The cast is then removed and cooled, and the finished prosthesis is removed. Grinding and polishing the prosthesis to a high luster is the final step. This final polishing is crucial to the ultimate comfort of the patient. The prosthesis is finally ready for fitting. In 1957, the American Society of Ocularists (ASO) was established to raise standards and provide education for the ocularist. In 1971, the ASO began to certify ocularists. Those who already had well established practices were automatically certified. Others had to complete a five year apprenticeship under the direct supervision of a previously certified ocularist and complete 750 credit hours of related instruction approved by ASO. In 1980, the National Commission of Health Certifying Agencies (NCHCA) created an independent testing organization for ocularists called the National Examining Board for Ocularists (NEBO). In November of 1981, NEBO administered the first National Boards certifying exam. Board certified ocularists must be recertified every three years. To achieve Fellowship in ASO, a board certified ocularist must accumulate 375 additional credit hours of related instruction and have demonstrated outstanding ability in their practice. Improvements will continue in the ocular prosthesis, which will benefit both patient and ocularist. Several developments have already occurred in recent years. A prosthesis with two different size pupils which can be changed back and forth by the wearer was invented in the early 1980s. In the same period, a soft contact lens with a large black pupil was developed that simply lays on the cornea of the artificial eye. In 1989, a patented implant called the Bioeye was released by the United States Food and Drug Administration. Today, over 25,000 people worldwide have benefited from this development, which is made from hydroxyapatite, a material converted from ocean coral and has both the porous structure and chemical structure of bone. In addition to natural eye movement, this type of implant has reduced migration and extrusion, and prevents drooping of the lower lid by lending support to the artificial eye via a peg connection. Though it may take several more years before a prosthesis will both look and see just like a natural eye, a Canadian company is developing an artificial eye that will be connected either to the optical nerve or directly to the visual cortex. This eye consists of a rubbery lens that can change focus, a high-precision color processing system, and microscopic photo-receptors that sense the presence of objects and pick up motion. Researchers at MIT and Harvard University are also developing what will be the first artificial retina. This is based on a biochip that is glued to the ganglion cells, which act as the eye's data concentrators. The chip is composed of a tiny array of etched-metal electrodes on the retina side and a single sensor with integrated logic on the pupil side. The sensor responds to a small infrared laser that shines onto it from a pair of glasses that would be worn by the artificial-retinal recipient. Tillman, Walter. An Eye for an Eye, A Guide for the Artificial Eye Wearer. F.A.S.O., 1987. Johnson, R. Colin. "Joint 'biochip' project eyes artificial retina," Electronic Engineering Times, September 18, 1995. Munro, Margaret. "Building a better eyeball," Montreal Gazette, April 19, 1995. American Academy of Ophthalmology, 655 Beach St., San Francisco, CA 94109, 415-561-8500. http://www.eyenet.org/aao_index.html . Digital Journal of Ophthalmology. http://netope.harvard.edu:80/meei/ . "Integrated Orbital Implants." Movements On-Line. http://www.ioi.com . Mie University School of Medicine Department of Ophthalmology. http://www.medic.mie-u.ac.jp/ophthalmology/index.html . Ocular Surgery News. http://www.slackinc.com/eye/osn/osnhome.htm . I am interested to have an artificial eye on my right due to pain and other feeling that makes me feel uncomfortable. What is the disadvantages and advantages on it and will it help me in the pain that i have felt as my doctor said that its uncurable.Please help me. Thank You and Godbless. Is artificial eye the only way to reduce depression? Will look alike with unaffected eye in term of cosmetic aspect?